That’s Jake Schmidtlein’s advice to other couples, but especially husbands and fathers. But Schmidtlein himself admits to being dragged reluctantly by his wife Sheena to a “Living in Love” retreat earlier this year. Now the parishioner of Mother Teresa of Calcutta in Topeka is not only sharing what he’s learned, but encouraging others to seek out similar opportunities. 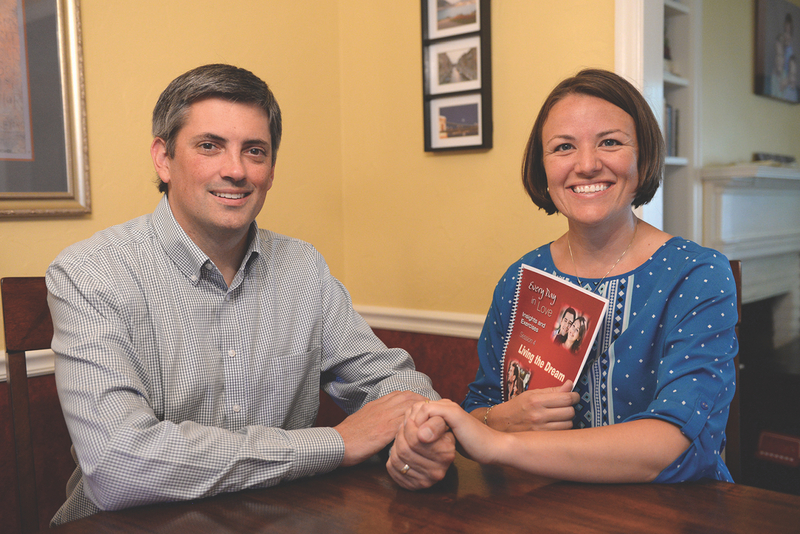 It’s been six months since the archdiocese launched the Joyful Marriage Project, an initiative designed to help couples grow in Christ’s vision for marriage. Three couples represent the wide variety of Catholic couples who have participated in the Joyful Marriage Project thus far. Graham and Nicki Johnston, members of St. Pius X in Mission, saw an announcement in their parish bulletin and an article in The Leaven. They realized that their marriage of nearly seven years had accomplished the first step of the project — they’ve built their union on a strong foundation of faith and prayer — but there was always room for improvement. “We knew we wanted to participate in some aspect,” Nicki said. Level Two of the Joyful Marriage Project focuses on building the structure and walls of a marriage. One way the Johnstons are working to build the walls of their marriage daily is to write affirmations of each other and exchange them each night after their children are asleep. Married 14 years this November, Jake and Sheena Schmidtlein have successfully faced multiple storms in the past three years — but experience has taught them a little additional storm-proofing never hurt. In 2014, Sheena was diagnosed with cancer. Shortly thereafter, they both lost their jobs due to downsizing. Sometime in 2015, Sheena attended a women’s retreat. The retreat affected her profoundly. Doing something with Jake took on added importance after he lost a second job, again due to downsizing, and his mother received a cancer diagnosis. For Christmas that year, Sheena surprised Jake with the gift of a “Living in Love” retreat during the upcoming Valentine’s Day weekend. Jake admits he went reluctantly. However, after a few minutes, he realized he had made the right choice. “I thought, ‘There’s something to this,’” Jake said. He and his wife learned many new communication tools at the retreat, he added. Among other things, they discovered different ways in which men and women express love, how to pick up on nonverbal cues and how to discuss petty annoyances. As a woodworker, Jake said he appreciates learning about new tools for his hobby as well as attending professional conferences for his job. He said people should treat their marriages in the same manner. “Why wouldn’t you want to put another tool in your toolbox for your marriage?” Jake asked. The Schmidtleins have also participated in another retreat called “Recharge.” These days, the couple often shares their story to encourage others. For several months now, John and Annie Smile of Holy Spirit Parish in Overland Park have hosted an open house of a different kind. Married for nine years, about six months ago they began mentoring engaged couples. Now working with a third couple, the Smiles said they try to provide a relaxed atmosphere. One night a week, the couple has an engaged couple over for refreshments, while they teach themes of the Preparing to Live in Love curriculum. The couple started discerning a call to this ministry after talking with three of John’s sisters, all of whom married in the past two years. As they heard about other diocesan marriage preparation programs, they wondered how they could help couples in this archdiocese. Shortly after calling the office of marriage and family life, the couple was matched with their first engaged couple. As the couple prepares for each mentoring session, Annie said they find themselves learning and discovering new things about one another. It’s something they’d encourage other couples to consider. “You don’t have to have the perfect marriage. If you have a solid faith, there’s no reason not to jump in,” John said. For more information about the Joyful Marriage Project and to find additional marriage resources, go online.